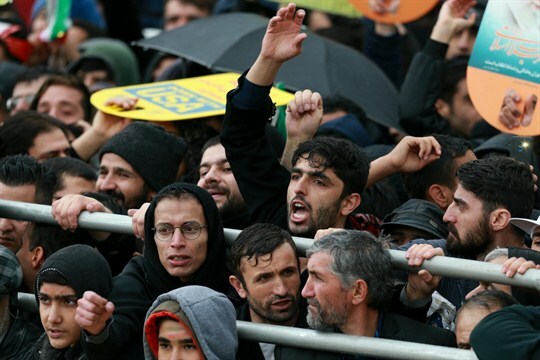 A group of Iranians listen to President Hassan Rouhani during a ceremony marking the 40th anniversary of the Islamic Revolution, Tehran, Iran, Feb. 11, 2019 (AP photo by Vahid Salemi). In the picture, a woman raises her left fist while using her right hand to shield her face from a cloud of tear gas. She’s standing behind a barrier outside the University of Tehran, with spindly trees visible in the background.